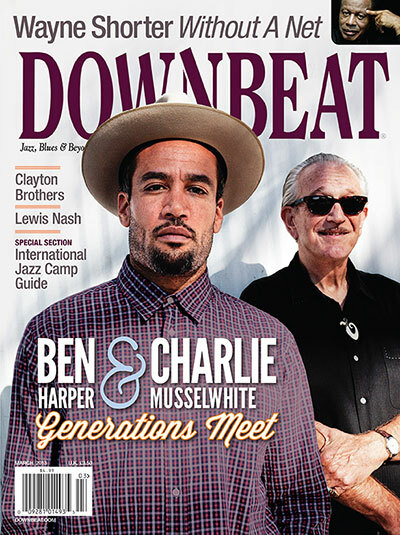 All the latest news about Keith Hall recordings, tours, reviews and more. Registration is open for the 2013 Keith Hall Summer Drum Intensive and a picture of us was included in Downbeat Magazine’s 2013 International Jazz Camp Guide. 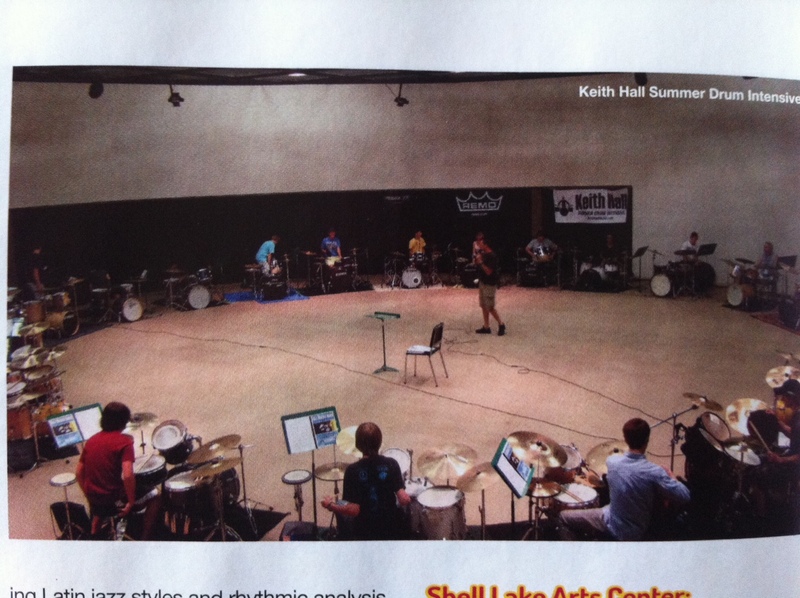 Look at all those drummers!! 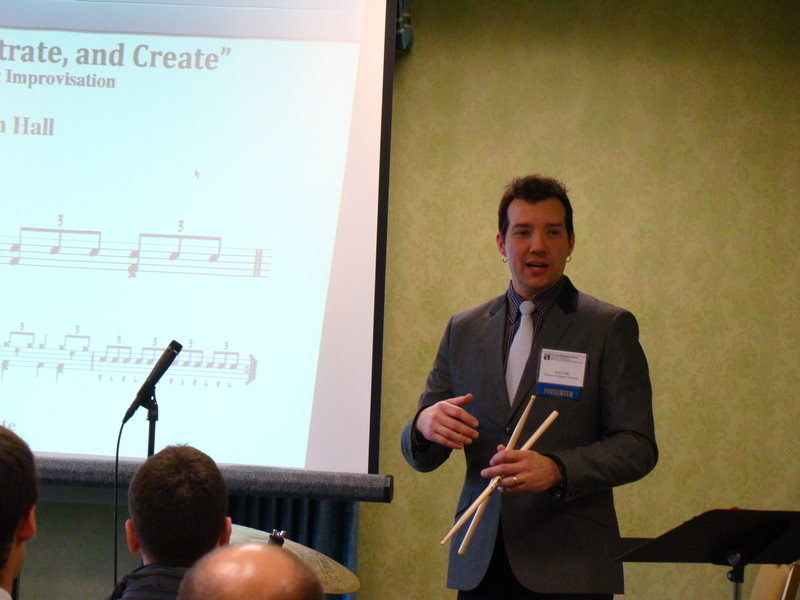 Keith recently presented at the Michigan Music Conference and shared his “Imitate, Orchestrate, Create” concept. 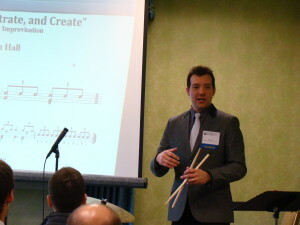 This material will be included in his upcoming book “Jazz Drums Now! Vol. 2. Everyone in the audience was playing on their lap and air drumming. 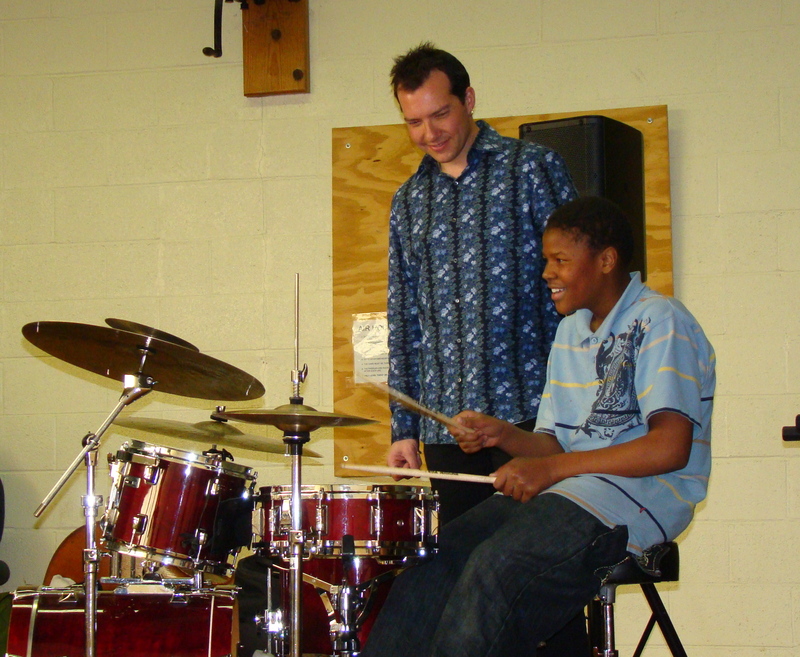 It’s still true…Everyone wants to be a drummer! 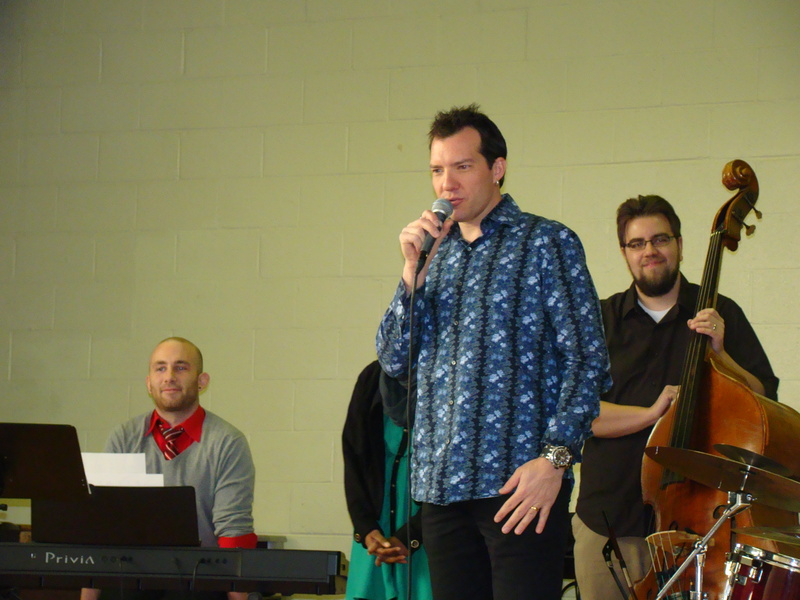 Keith and a group of students from WMU presented ‘Jazz Is Our Music’ to Woods Edge and Valley Center Schools sponsored by Education for the Arts. Keith had the privilege of sharing the stage with some amazing speakers at Catalyst2013 where he spoke on ‘Improvising Creativity’. 800 people at a sold-out event with speakers like Corey Booker, John Acuff, Nancy Duarte and others. 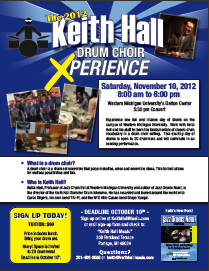 Registration is open for the 2013 Keith Hall Summer Drum Intensive! Friends, I need your help. Last week, I had the opportunity to present a jazz education program sponsored by Education for the Arts to a school in Kalamazoo. The school serves boys age 8-18 with emotional disorders. It was an amazing experience for all of us. They were really into the music, air drumming, moving in their seats, and singing along. During our performance, our good friend Julie Parker noticed that these 35 boys did not appear to have much in the way of clean or appropriately fitting clothes. The office confirmed that the boys are definitely in need. SO…..we are taking action! We are asking for donations of boys clothing, or money that will be used to purchase things they need. You can email me for clothing donations or go to my website to donate money. We will shop this week so they will have things by Friday for Christmas. We want to continue to serve these boys and make an impact in their lives. Won’t you help us? 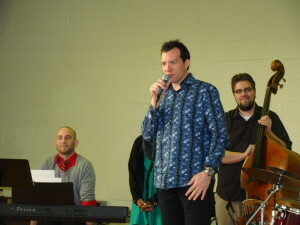 Keith@KeithHallMusic.comHelp us bless boys ages 8-18 in Kalamazoo. 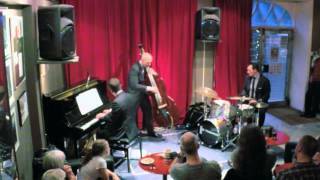 I just finished a couple successful tours in Europe with Curtis Stigers. We traveled to Switzerland, The Netherlands, Germany, Luxembourg, Paris, and Denmark. We have been touring to support his new CD, “Let’s Go Out Tonight.” We met some wonderful people, ate and drank some tasty treats and had lots of fun making music! The KHDCX was a great success for everyone on November 10. 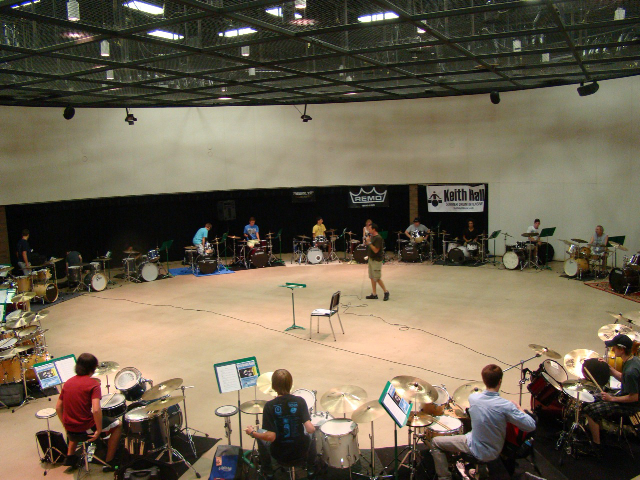 The Drum Choir Xperience is a unique one-day experience with a focus on playing in a drum set ensemble. 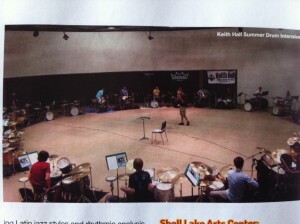 The 6th Annual 2012 Keith Hall Summer Drum Intensive was a smash! The 6th Annual 2012 Keith Hall Summer Drum Intensive was an amazing success including 42 drummers. Stay tuned for next year’s dates.